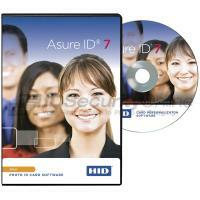 Asure ID software offers an intuitive interface that simplifies ID card design and data entry. Easy-to-use and affordable, Asure ID software is the perfect combination of advanced functionalities and user-friendly features. Asure ID Exchange: Support for more sophisticated secure credential applications, providing advanced smart card functionality and laser engraving. All versions are packed with unique features such as automatic startup loading of the last template and report used, tabbed navigation, and easy switch between card design and data entry. You can design and print all your badges such as corporate IDs, healthcare cards, student IDs, access control badges, event passes, national ID driver�s licenses, or government credentials. Find out now with Asure ID software version is right for you! WHAT ARE THE DIFFERENT VERSIONS OF ASURE ID SOFTWARE? From entry-level to fully-features, Asure ID software versions are designed to answer different printing needs. To help you make the right decision, you will find below the main specs of each version. Asure ID Solo: this entry-level option is great to design photo ID badges in no time. Design single or dual-sided template, add text fields (variable & static), photo fields, import images (e.g., logos & graphics) or add a linear barcode. This version also supports magnetic stripe encoding. Asure ID solo allows you to add up to 8 data fields, design CR80 cards only, and save up to 200 records. Asure ID Express: this version allows you to add as many data fields as you want. It also includes more features such as password log-on with definable user privileges, integrated signature capture, batch and sheet printing, and reports (standard & custom). It is the perfect choice for organizations looking for affordable stand-alone photo ID card software with advanced card design and batch printing capabilities. Asure ID Enterprise: designed for large corporations, Asure ID Enterprise allows multiple workstations to share a common database over a network. Multiple databases are supported via Live Link (real time data exchange): MS Access (2000, 2005), and MS SQL Server (2000, 2003, 2008), as well as ODBC Import/Export. Asure ID Exchange: this version includes smart card encoding and management for easy integration of technology cards. It supports MySQL (2000, 2005, 2008), Oracle (9i & 11g), and Microsoft Active Directory/LDAP. Asure ID Exchange also includes a Laser Configuration module for simplified setup and maintenance of the HDP8500LE Laser Engraver. WHAT TYPE OF CARDS CAN I DESIGN AND PRINT WITH ASURE ID SOFTWARE? Asure ID software allows you to create any type of badges on demand.